Go for a walk and get your blood moving again, or, if the weather is nasty (its spring in Michigan after all), get away from it all for an hour or two with a movie. You can check the catalog for your favorites, or you can browse by entering “feature film” in the keyword search box. Pick a comedy or a fantasy, watch it with your friends. 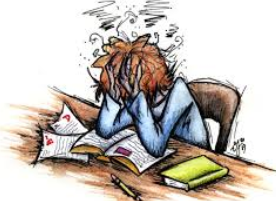 Taking a little break from studying will help your eyes uncross, and your brain won’t feel so overloaded. Good luck on all your finals!